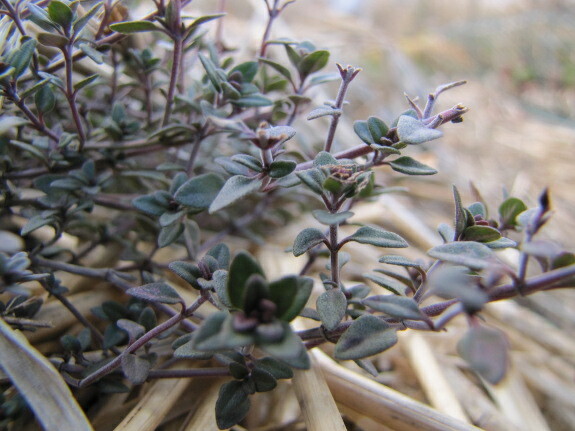 Thyme stays green all winter, but I feel like the perennial is starting to push out new leaves --- a good thing since I've been harvesting some every couple of weeks to season our dinners. 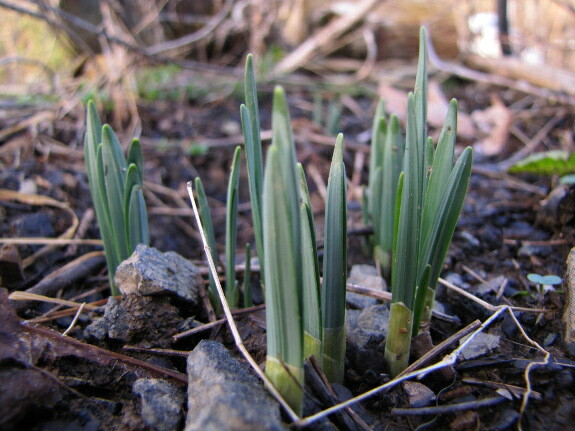 And the daffodil leaves have been pushing up out of the soil for a week or two, promising that spring will be as beautiful as it is bountiful. Our chicken waterer is the best way to get chicks off to a good start with clean water and dry litter. We still have 5 more persephone days here in NE Ohio but I have been predicting spring around every corner, lol. I'm glad to hear it's arriving in Virgina and is on its way! No signs of germination under the quick hoops I planted on Jan 2nd, but we have had very little sun so the temps have stayed quite cool. I'm hoping for germination mid-February. Yesterday felt like spring here in Floyd, Va and it seems like we're in for another one today. Some people are happy about this, but I think we're going to have one heck of a tick problem this year, and I've already heard of three people I know in our community who have contracted Lyme's disease in the last couple of years. Also the wilt fungus and beetle problems that are killing off oaks will probably get another foothold, not to mention kudzu and other invasive plants that are usually kept in check up here by the cold winters. And, of course, there will be little to no sap run for the maple sugar lovers around here (we were borderline as it was with fewer sugar maples this far down the map). So while spring is nice, I do hope we get a couple of weeks of a nice cold snap with a few inches of snow before the lilies start to bloom. We hardly had a winter this year. The leaves didn't fully drop until mid-December. I think the cold weather came for the two weeks that I was in Virginia, and it has been in the 60's and 70's just about every day since. For the first time since we moved here, we actually had snowdrops blooming on January 1 this year (we're up in PA, so we're further north than you, but not in the mountains). It was very disturbing to my psyche, I assure you. Our eco-systems are made to have winter, so I can't help but feel that this almost complete lack of winter is going to cause problems. Plus, having grown up in the snow belt, I get very cranky when there's no snow! Boy, I seem to have opened up a can of worms with my fluffy spring post. John --- I need to make a post about Persephone days and seed starting. I generally go by soil temperature to start seeds --- the Persephone days alone don't help much with that. But I'll make a post soon about it, so won't go into it more now. Sara --- I was emailing with someone in Florida who had her AC on over Christmas. Now that's disturbing.... Clearly, I'm not cut out for the true south. Debbi --- I wouldn't worry about your daffodils. They're pretty resilient! 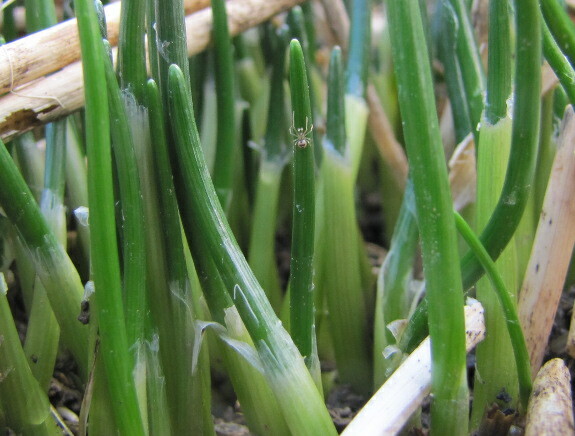 They'll pause when it gets cold and then grow again. I'll bet you'll get blooms no matter what. J --- Thank you so much for spreading the word! Ikwig --- The mountains sure do make a difference. No blooming snowdrops here yet! That would be pretty odd.